Capstone Vietnam cordially invites you to participate in a unique StudyUSA & Canada Higher Education Fair Series in fall 2019 that includes six (6) cities in all three regions of Viet Nam, including key primary and secondary markets. Usually, Haiphong is scheduled only for the fall and Nha Trang for the spring but due to the success of both fairs in spring 2019, we decided to add Nha Trang to the fall schedule. In addition, we will cap off the series with a fair in Vung Tau, a coastal city that is 2.5 hours or so from HCMC. The end result is an exciting and productive North to South tour that will keep you busy not over-scheduled. Viet Nam is major sending country for both countries. As of August 2018, it ranked 5th among all places of origin with 29,788 students at all levels. In Canada, Viet Nam ranked 5th last year with 20,330 students, a one-year increase of 45%, which was the highest of any sending country. Demand for overseas in general remains strong because of continuing widespread dissatisfaction with the quality and capacity of the domestic higher education system, the reputation of overseas educational institutions for quality, the prestige factor of a foreign educational credential, and the unprecedented ability of parents to afford overseas study. This is a great time to join your colleagues who have already traveled to Viet Nam to begin, or continue, your recruiting efforts in this exciting market. 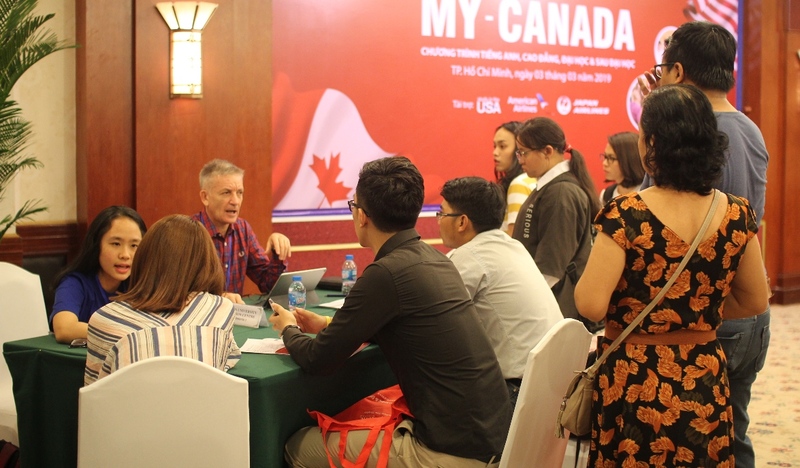 Fairs are a great way to introduce your institution to students and parents in different parts of the country who are eager for information about study opportunities in Canada and the U.S. It is often the connection you make with a student or parent that convinces them to choose your institution over others. (This includes juniors and sophomores who will not be applying for overseas study for another year or two.) In addition to the fairs, representatives are strongly encouraged to participate in the related high school visits and other activities. Post-fair follow-up via email, telephone, and Facebook conducted by Capstone’s educational advising team. Students and parents can search for participating schools on Capstone’s website using a searchable database that is part of a new CRM system. The fair guide will available on Capstone’s website immediately following the fairs. An opportunity to learn about the many advantages of pursuing higher education in Canada and the US. Follow-up via email and telephone on leads generated by the fairs and high school visits starting with those classified as “hot leads”. Institutions may be represented by two colleagues of their choosing. This means a total of three at your table, including your student assistant. Each school will be assisted by a student volunteer, who will help to represent your school and facilitate communication with students and parents. You have the option of contacting your student volunteer(s) before you arrive. There is time set aside for you to meet with them before each fair. We are proud of our student volunteers, who have received consistently outstanding evaluations in each city. Dr. Mark Ashwill, managing director and co-founder, will conduct a country briefing to provide participants with relevant and useful information about local market conditions and trends. (We’re happy to send a PDF version to those colleagues who cannot attend.) To learn more about Dr. Ashwill’s background, have a look at this biographical sketch and read this 2017 interview entitled Capstone Vietnam: Why This Education Entrepreneur Is Excited About Vietnam’s Future. Visits are arranged to high schools with sizable numbers of alumni who study overseas, including in Canada and the US. Consular briefings (US only) will be arranged in HCMC or Hanoi, if possible. Canada has a very high issuance rate for study permits, which makes this a non-issue. In addition to all of the above, Capstone hosts a group dinner in HCMC, and organizes an excursion to the UNESCO World Heritage site of Hoi An for those who participate in the Danang fair. Both are great opportunities to network in a relaxed setting and learn more about Vietnamese society and culture. You should obtain a business visa from the Embassy of the Socialist Republic of Viet Nam in your country or one of its Consulates General with a letter of invitation from Capstone Vietnam that will be sent to you as part of the fair package after you register. Since you will be traveling to Viet Nam for official purposes and participating in public events, it’s important that you have a business visa. 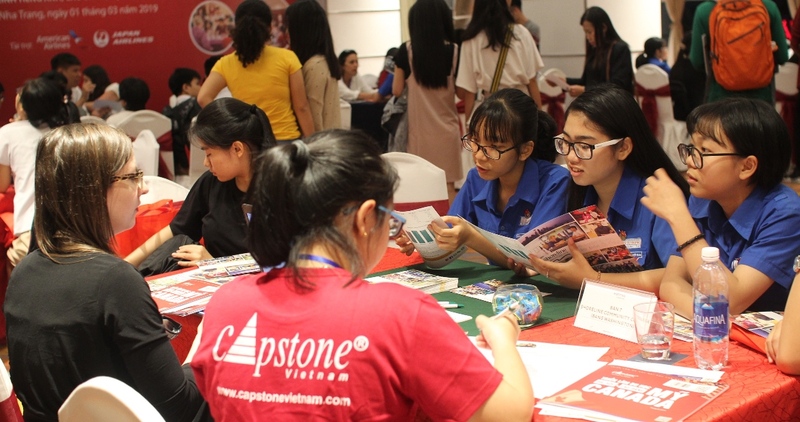 Here’s what some colleagues have had to say about Capstone Vietnam and our fairs. 1- Quality: Only regionally accredited institutions from the US and officially accredited institutions from Canada are allowed to join the StudyUSA & Canada Higher Education Fairs. This is good both for you and the students/parents who attend our fairs, for whom quality is of paramount important. Honor by association is a win-win proposition. 2- Superior service: During their time in here, we take good care of our fair colleagues both professionally and personally, if needed or requested. 3- Reputation: Capstone Vietnam is one of Viet Nam’s leading educational consulting companies. We pride ourselves on our commitment to innovation, excellence, and ethical business practices. 4- Location: The fairs are offered in key primary and secondary markets representing all three regions of Viet Nam. 6- Convenient and quick online registration and access to important fair-related documents, plus informative pre-fair updates. 7- Extensive interaction with Capstone staff, especially for colleagues who join more than one fair. This gives you the chance to learn more about student recruitment and the broader societal context in Viet Nam. 8- Organic attendance. Unlike some companies, Capstone doesn’t inflate attendance by paying schools to bus students without regard to their qualifications, hiring services that pay “students” to come, paying student volunteers on per head basis to “bring a friend,” or offering cash payments to attendees. This is one reason we have a reputation for attracting serious and quality students to our events. 9- Authoritative country briefing by Dr. Mark Ashwill, an international educator who has lived and worked in Viet Nam since 2005 and first traveled to the country in 1996. 10- Capstone scanning system for easy retrieval and storage of student contact information using a QR code or barcode scanner - your choice. 11- Post-fair follow-up. Our staff follow up on all leads via email and phone. We will also translate a message into Vietnamese that you draft for your student contacts, including fairs and high school visits – at no additional charge. 13- Integrity: We always look for best fit institutions for Canada- and US-bound students and their parents. In addition, our fair attendance is organic (e.g., we don't artificially inflate attendance) and our marketing ethical and extensive. We wholeheartedly embrace the notion that Success without integrity is failure. 14- Free initial advising services: Provided to all participants for all participating schools. 100% of the advising fee (except visa counseling, if desired) is refunded, if students enroll in a partner school. 15- Customized marketing and venue layout. Realizing that “one size doesn’t fit all,” we customize some of the marketing and organize the venue layout so that different types of institutions are in different sections of the ballroom to make it easier for students and parents. NOTE: Capacity is limited in each city so please register by early bird deadline, if possible, in order to ensure your participation. The fairs in Haiphong and Vung Tau will take place from 2:30 p.m. to 6:30 p.m., while those in Danang and Nha Trang will be held from 4-8 p.m. 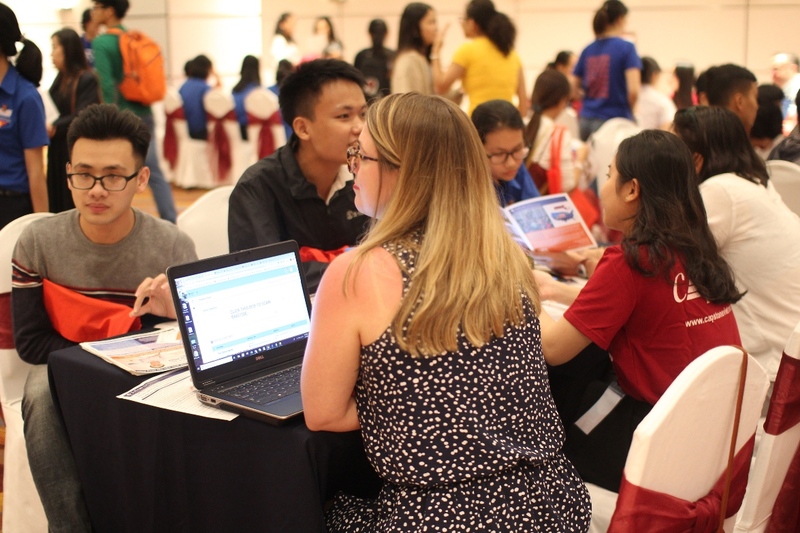 The Hanoi and HCMC fairs are scheduled from 3-7 p.m. All fairs are held in four- and five-star hotels that are familiar to students and parents. The fee includes fair registration, a student interpreter/assistant, country and consular briefings, high school visits/mini-fairs, a group meal in Hanoi or HCMC, full staff support in each city and ground transportation to related events, an excursion to Hoi An for those who join the Danang fair. It does not include domestic flights or hotels. (We are happy to help you make these arrangements – at no charge. We can add the cost to your invoice or bill you separately) We expect between 150 and 350 attendees, depending upon the location of the fair. Note: “Literature only” means that a carefully screened and trained student volunteer represents your school and is prepared to answer basic questions. We will introduce you to your volunteers before the fairs so that you can communicate with them via email and online chat. Capstone partner in Viet Nam: 5%, If you’re not already a partner and are interested in becoming one, please let us know and one of our staff will contact you. Since you’re here, you’ve probably already answered this question to your satisfaction but just in case you or your colleagues need more information and a stronger justification for investing in a fair series, here it is. The following articles by Dr. Ashwill and a 2017 interview with him contain some of this information. The reasons for having fairs in Hanoi and HCMC are known to most recruiters. They are the two most important urban centers in Viet Nam with a combined population of over 16 million. The former is the nation’s political capital while the latter is country’s economic engine. Many families have both the interest in overseas study and the ability to pay for it. Below is information about why we selected the other cities, all of which qualify as secondary markets. One of the key difference between these locations and Hanoi/HCMC is that the English proficiency of students tends to be lower simply because they have not had the advantages, both in and outside of the classroom, that their peers in the major urban centers have. There are fewer overseas study events and therefore a greater need for quality information. Note: All of the currency figures are in USD. Haiphong is Viet Nam’s premier port city, a major economic center, and third largest with a population of just over 2 million in 2017. In the same year, it recorded a gross regional domestic product (GRDP) growth rate of 14.01%, the highest since 1994 and twice as high as the national average. The new highway between Haiphong and Hanoi has shortened the trip to 2 hours (with good conditions) and the Cat Bi Airport was upgraded to an international airport in 2016. Its economy produces fish sauce, beer, cigarettes, textiles, paper, plastic pipes, cement, iron, pharmaceuticals, motorbikes, and computer software via outsourcing arrangements. Shipbuilding, steel pipes, plastic pipes and textiles are some of the industries with the highest growth rate. In addition to agricultural products, which include rice, corn, sugar and peanuts, there is a large fishing sector mostly through aquaculture. Foreign direct investment (FDI) has been pouring into Haiphong and vicinity. One example is of a project that is now operational is a $1.59 billion factory that produces OLED panels for TVs, mobile (cell) phones, smart watches, and tablets in an industrial park. In the past, the overseas study preference for Haiphong families was the UK. That has changed in recent years with much greater interest in Canada and the US. As in other secondary markets, the English proficiency of the average student interested in pursuing higher education abroad is not on par with that of their peers in Hanoi and HCMC, who tend to have more advantages both in school and with proprietary language centers. Like other locations outside of the two major urban centers, there are fewer large-scale events such as fairs and both a thirst and need for quality information. Danang (Đà Nẵng) is the fifth largest city in Viet Nam after HCMC, Hanoi, Haiphong, and Can Tho in terms of population and economic development. It is one of five municipalities under the direct administration of the central government. The city had a 2016 GDP growth rate of 9.04%,well above the impressive national rate. Its goal is to have a GRDP growth rate of 9-11% with per capital income ranging from $7,000 to $9,000 GDF from 2018 to 2030. There has been significant investment in Danang and vicinity in recent years. In 2018, the city granted new licenses to 126 FDI projects with a total investment value of $155.9 million, twice that amount of 2017. In sum, Danang has attracted a total of 679 FDI projects worth $2.9 billion and 322 domestic projects worth $4.2 billion. The main industries are seafood, textiles, footwear, engineering, building materials, arts and crafts, tourism, etc. High-tech industries, IT, and tourism are all viewed as key development drivers. The city government has received positive for its progressive policies related to urban planning and other development priorities. This includes seven years at the top and three years ranked 2nd in the Provincial Competitiveness Index (PCI) rankings compiled by Vietnam Chamber of Commerce and Industry (VCCI). Danang used to be a city that most international recruiters flew over on their way to Hanoi or HCMC. When he as country director of the Institute of International Education-Vietnam, recognizing that there was growing demand for overseas study in this rapidly developing city in central Viet Nam, Dr. Ashwill, Capstone managing director, organized the first EducationUSA fair in Danang. He continued to organize fall and spring fairs there on behalf of Capstone Vietnam. Unlike Hanoi and HCMC, which are saturated with overseas study fairs, the scene in Danang is quieter. Both the demand for overseas study and the requisite ability to pay for it have grown in recent years, making it an essential destination not only for fairs, especially for the US and Canada, but also for small-scale events such as information sessions for certain types of institutions. Students’ English proficiency has improved considerably in recent years. Nha Trang is a coastal city in southcentral Viet Nam, a short flight from HCMC. (It is generally agreed that the name comes from the Cham language, Ya Trang or Ea Trang, and means “reedy river,” in reference to the Cai River that flows past the city.) Nha Trang had a 2018 population of 535,000. Most of the city’s economy revolves around tourism. Other industries are shipbuilding and seafood. Given its location, the city is also a center for marine science. Most of the FDI flows into real estate projects, including resorts and hotels. While Nha Trang is a relatively small secondary market, it is well worth it to organize a US and Canadian higher education fair there for several reasons: 1) growing ability to pay related to the rapid expansion of the tourism sector; 2) interest among families of means in overseas study, including in the US and Canada; 3) the lack of access for interested parents and students to quality information about overseas study. The market is always changing, often in positive ways. The reason why we decided to add this city to our fall itinerary was because of a very successful spring 2019 fair there. Vung Tau is a coastal city about 100 km (62 miles) from HCMC that is best known as a tourism hub. More importantly from a financial perspective it is also the crude oil extraction center of Viet Nam. Vung Tau is located in Bà Rịa–Vũng Tàu Province, which has one of highest GDP per capital incomes and standard of living in Viet Nam. The region’s GRDP grew by 7.2% in 2018 (excluding oil and gas), the fastest in eight years. (Oil and gas extraction, which takes place in the East Sea, known to the rest of the world as the South China Sea, is the main reason why this region contributes close to 8% of the national GDP and over 10% to the government coffers.) The industry and construction sectors accounted for 57.43 percent of the total economy, followed by the services, agriculture, forestry, and fishery sectors. After receiving your registration, we will send you an invoice within a week with instructions about the international wire transfer or other method of payment. After you wire the payment to Capstone Vietnam, please fax the wire transfer confirmation to us at 84-4-3938 8456, or email a scanned version to us at [email protected] . 50 days + before the first fair: 70% refund. If payment has not been made at the time of cancellation, Capstone Vietnam will invoice schools based on this refund policy. By submitting this registration form, you confirm that you have read and agree to these terms. You may choose between OCS and Air Concepts, both of which have good in country teams, which is important for handling any customs-related problems that may arise. Once you register, you will receive a fair package with information about both options. It's your choice. If you wish to ship your materials directly, your best choice is Fedex or DHL. However, even with Fedex or DHL, there are times when materials are held up in Customs and a fee might be required to obtain them. Customs frequently does not release materials in time. If you have not already done so, it is essential to have your promotional materials translated into Vietnamese. Keep in mind that most Vietnamese parents do not read English and they are the key decision-makers, after all. Capstone Vietnam can arrange to have your promotional materials printed in country at additional cost. The advantages of in country printing are convenience (e.g., no problems with Customs) and substantial cost-savings, including printing and shipping. We can also ship materials to a recipient of your choosing in Viet Nam (e.g., agent, high school) – at modest cost. Contact us for details. Capstone invests a considerable amount in marketing and promoting its fairs series, including high school outreach, online marketing, extensive use of social media (e.g., Facebook), email blasts, a promotional video, flyer and poster distribution, street banners, phone calls, text messages, and the use of teams of student volunteers in each fair city. Attendees have the option of registering online, the main advantage of which is streamlined entry to the fair, or on-site registration. Our goal, in the words of one colleague whose testimonial appears above, is “to attract authentic prospective students.” We dot our bureaucratic I’s and cross our T’s, meaning we secure all the necessary permissions from the authorities for the fairs and related activities. In addition to the usual pre-fair publicity, we offer several marketing options designed to generate additional student/parent interest in your school. We’re also willing to organize individual info sessions or coffee talks before or after the fairs on a first-come, first-served basis. Costs vary, so please contact us for more information. The Capstone Scanning System, which has received positive reviews, allows you to scan student information using a barcode scanner, which we supply at no additional charge, or a QR Code scanner using your iPhone or iPad. This means you have real-time information about the students coming to your table, which facilitates quick follow-up. We publish a colorful and informative fair guide that is distributed free of charge to all attendees. It provides basic information about institutions, including selling points, academic programs, tuition and fees, admission requirements, etc. It also contains articles of interest to students and parents. Follow this link to have a look at the spring 2019 fair guide. Extra copies of the fair guide will be distributed at the offices of Capstone Vietnam, selected high schools, etc. until the next fair series. Only institutions that submit their Institutional Profile by the priority deadline will be included in the fair guide. For the first time, in response to growing demand from international schools who have students whose native language is not Vietnamese, we will have an online edition in English. Advertising in the fair guide is open to all regionally accredited schools in the United States and officially accredited institutions in Canada, regardless of whether they participate in the fair series. Advertising helps to brand your institution and signals your interest in welcoming Vietnamese students to your campus. Those that do not participate in the fairs can use advertising as an opportunity for fair attendees and others to learn about the many advantages of attending their school. A password-protected resources page containing an updated list of recommended readings and links to online resources about Viet Nam and education will be made available to registered participants.